Website and processes: 12 Aug 17 Donna Richards, 5/5 Excellent "Really simple website to navigate through! Thanks "
This is an opportunity to see Kent from a totally new angle. After a warm welcome from your instructor and a short safety briefing in our passenger lounge you will take to the skies. 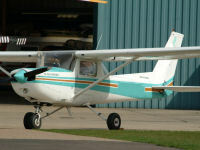 During the flight which is in a two-seater Cessna 152, you will be flying over the Isle of Thanet. Friends and family are welcome to accompany you on your visit and on sunny days will be able to take advantage of our open-air patio overlooking the main taxiway and runway to watch the aircraft depart and take photographic evidence of your flight! At the end of you flight you will be presented with a Certificate to prove that you have flown the aircraft and this time may be logged towards your Private Pilots Licence. This experience is not suitable for pregnant women or epilepsy sufferers. Romney Marsh, Kent TN29 9QL.